Even as far back as the early 1990s, during the initial years of Junior Seau's brilliant two-decade NFL career, the linebacker would complain to his then wife Gina of searing headaches. "When he would come home from games, he would go straight to the room," Gina told Showtime's "60 Minutes Sports" in an episode that airs this week. "[He'd] lower the blinds, the blackout blinds, and just say, 'Quiet, my head is, is burning.'" 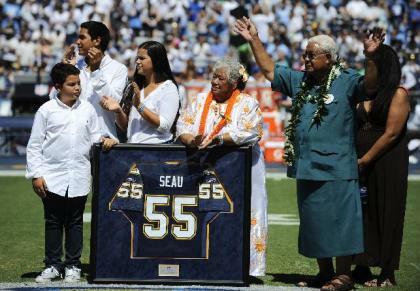 After Seau retired in 2010, his children slowly watched their dad's famously charismatic personality grow distant. He began slipping away from them. The post-NFL life they all envisioned became a nightmare. "I saw a man that right before my eyes [was] changing," son Tyler Seau said. "He wasn't that happy-go-lucky guy anymore." "It was hard," daughter Sydney said. "Because we were all reaching for someone that wasn't exactly reaching back, even though we know – we knew that he wanted to." Seau committed suicide in 2012 via a gunshot wound to his chest in a spare bedroom of his California home. He was 43. His death served as a final shock for any reasonable mind to recognize the devastation of chronic traumatic encephalopathy (CTE), the brain injury that is prevalent in football players. These are the first extensive on-camera comments from the Seau family on Junior's death. They sat down with reporter Armen Keteyian in a thorough, layered and important report on CTE and football's role. They provide a human touch to a problem that fans, media, coaches and players often understandably want to ignore, especially during the excitement of the NFL playoffs. It's the cruelest of diseases, currently detectable only after death, although the symptoms can be obvious. Seau suffered from insomnia and mood swings, often self-medicating with substance abuse. He was erratic and began making rash decisions both personally and in his business life. He was a man at war with himself. It stood in stark contrast to the likeable player and personality that fans nationally grew to know. Seau played with great passion, always flashing an infectious smile. He was particularly popular in his native San Diego, where he was a Chargers star for 13 seasons. That Seau shot himself in the chest, preserving his brain for study, was no accident many believe. He wanted the truth discovered and it was after his brain was sent to the National Institutes of Health. Just before taking his life, he sent his children a final text: "I love you," it read. It's why, they say, they have refused to accept the NFL's $4 million settlement offer to the family. It is part of the league's general deal reached with former players who are later determined to have suffered from CTE. The Seaus told "60 Minutes Sports" they are pursuing their own lawsuit because the NFL fails to acknowledge any liability or responsibility for CTE in its offered settlement with an estimated 21,000 ex-players. It's not, the Seaus say, about acquiring additional money. This, they believe, is what Junior would have wanted. "It's about the message," Sydney Seau said. "We're risking everything." "The NFL is taking no ownership for what they've done," Tyler said. "There's no responsibility on their part. They're basically giving you a number and [being] like, 'All right, there you go. We're done.'" Whatever the motivation, the issue is real and continues to grow as more and more players suffer as the game has grown bigger and more violent. The NFL has taken steps to improve the safety of the game and real-time medical care players receiver after suffering head injuries. Seau was never diagnosed with a concussion during his career. The NFL declined an on-camera interview with Showtime, instead defending its settlement offer in a statement that concludes: "Doing the right thing by putting aside its strong legal defenses and agreeing to provide substantial compensation to its retired players … in a way that is fair, reasonable and adequate." The legal system will determine how much further the Seaus can push. That their pained voices are heard in the wake of Junior's death, however, is important in its own right, especially here in the heart of the playoffs.